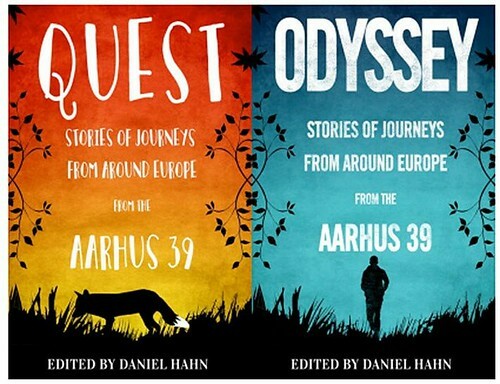 Quest is the ‘younger’ half of the two Aarhus short story collections, edited by Daniel Hahn. I use quotation marks, because I am less convinced of the age ‘gap’ than has been suggested. Yes, it is a little younger than Odyssey, but I felt many of the characters in Odyssey were not proper YA material; they were children who tried out older behaviour. It’s not important, as both collections offer a great range of stories from all over Europe. As with Odyssey, the authors are occasionally quite famous, and so are the illustrators, and I’ve come across several of the translators before as well. Of the 17 short stories in Quest I chose to start in the middle, because I just had to read the one by Maria Turtschaninoff first. I might have a crush on her. The story, The Travel Agency, did not disappoint. In fact, I could want to read a whole book based on it. It’s unfair to pick favourites, but I did enjoy Maria Parr’s A Trip to Town, about a girl and her grandma. And as for Journey to the Centre of the Dark by David Machado; you’d do well to have a hand to hold. In the end it didn’t go quite as far as I kept being afraid of, but I’d be happy to offer my idea to anyone who feels like writing scary stories. The Quest stories are not as dark as in Odyssey. Maybe that’s why they are offered as children’s stories. And perhaps that’s why they suited me better. But, in short, I can recommend these two collections as a starting point for fun with unknown [to you] names in children’s literature.